Here is my first spectrum taken with the following setup : Alpy600, Newton 200 mm F/5, Atik414Ex (science camera), ASI290mm for guiding. This is a spectrum of Phi Pers a Be star. I tried to assess the rotational velocity of the dust disk around the star. Please tell me if the method I followed is correct or how I can improve the assessment. Ha et Hb lines in emission are clearly visible on spectrum. No P Cygni profile is visible, maybe due to the low resolution. He I absorption line seems to be very weak. The apparent rotational velocity of the dust disk is related to FWHM of the emission lines. For the Ha line, the theoretical FWHM_instrum of the Alpy 600 seems to be 6562/600 = 10,9 A. 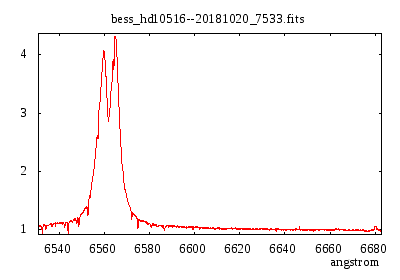 But I measured the FWHM of 8 isolated and non saturated emission lines of the Ne-Ar lamp in that range of wavelength (6000 - 7000 A) and work out the average. The true FWHM_instrum seems to be closer to 11,5 A rather than 10,9 A for Ha line. For the Hb, i could assess the FWHM_instrum with only 1 emission line at 4158 A from the Ne-AR lamp, it was 9,7 A. The measurement of the FWHM is not really precise and relies on how you choose the limits of the start and the end of the emission lines. Even by dividing by the continuum it's not easy to know which value to write down. Few measurements on the same line give me a fluctuation of ~0,1 A ~0,2 A on the FWHM. How do you measure your FWHM properly ? I didn't assess the uncertainties but i would say it is about ~100 km/s. The literature (2002) gives a rotational velocity of 410 km/s . My results are not that bad ! It should be possible, but dont know how yet ! (Note Be Stars do not show P Cygni profiles, these are an indication of stellar winds, not rotating discs). The FWHM of the Ha line i've measured is about 15,5 A. On the spectrum from BeSS, how can u determine the FWHM of this kind of "splitted" line ? To determine the velocity of the disk I red that dv ~ (0,4 ... 0,5) v sin i. The distance dv between the peaks is ~5 A, that leads to a ~450 km/s velocity. Lionel Mulato wrote: On the spectrum from BeSS, how can u determine the FWHM of this kind of "splitted" line ? I think ISIS fits a Gaussian profile to the line and quotes the FWHM but that is only a rough measurement of what is physically happening. The line profile is a combination of the photospheric absorption component from the star and the emission from the disc. The split line is because we are seeing the disc approximately edge on. Part of the disc at 0 RV is hidden behind the star so the emission is less in this region. (The line can even be in net absorption in this region if the emission from the disc is weak.) There is not a single value for the disc rotation velocity. The disc material is in Keplerian orbit round the star so the velocity varies through the disc depending on the distance from the star.